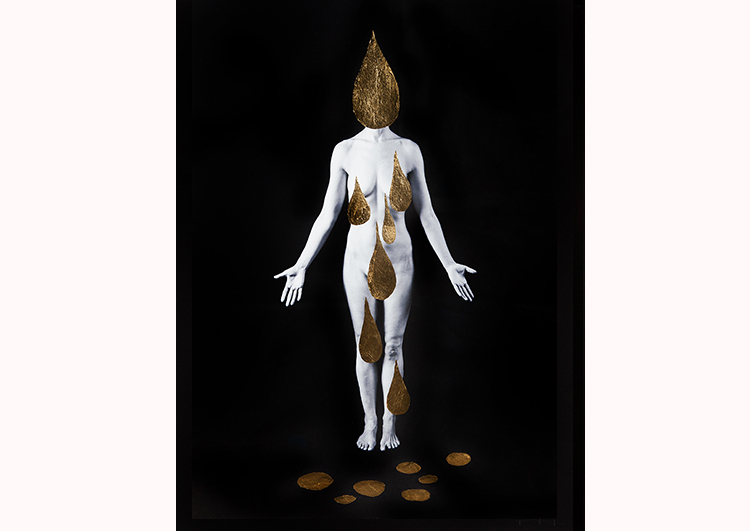 Dina Mitrani Gallery is pleased to present Marina Font’s Mental Maps, a photo-based mixed media exhibition that depicts the artist’s continued interest and expression of the female experience. As a “next chapter” after her series Dark Continents, symbolically illustrating female sexuality in all its capacities and cycles, Mental Maps looks deeper into the psychological and emotional aspects of women. Font embroiders yarn, thread and found textiles onto the photographic surface creating a hybrid environment with a nod to meditation on process. 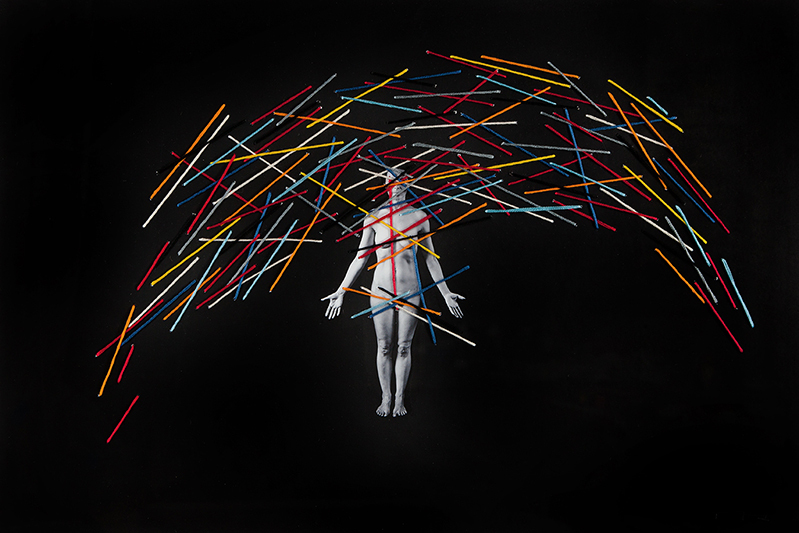 These black and white photographs of the female figure, together with a meticulous weaving of color and design, punctuate the various complexities of women’s thoughts and inner-workings. The laborious and time-consuming process is evident, and also points to traditional historic roles of women. In many instances, a woman’s stream of consciousness is illuminated and / or manifested within the process of ritual, creating a spiritual element to the seemingly mundane. The female body in the photographs is always the same; she stands in a position reminiscent of anatomical studies one may find in a biology book. The image is printed on paper or canvas, which is then where the artist paints and draws with yarn or gold leaf, depicting patterns and symbols for the viewer to decipher. It is no coincidence that the artist uses vintage fabrics that have been found in flea markets or given to her by friends. These textiles represent our mothers and grandmothers, their stories, their homes and their habits. 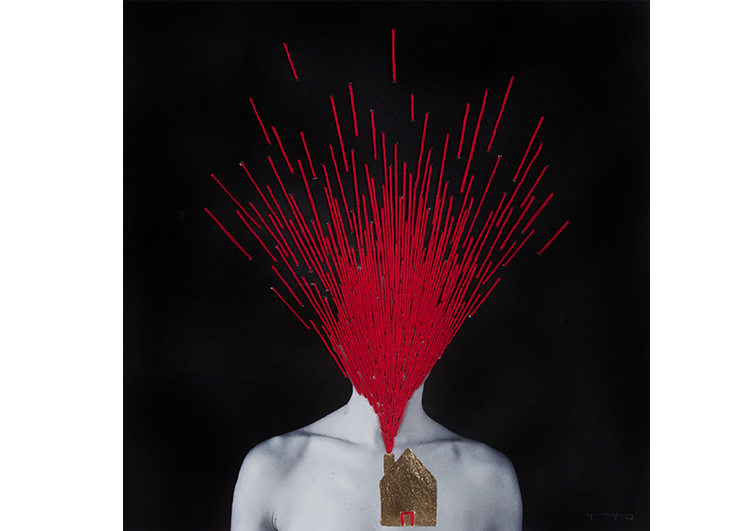 The exhibition presents poetic and mysterious imagery that provokes in a conceptual and visual manner. Marina Font was born in Argentina in 1970 and studied design at the Martin Malharro School of Visual Arts, Mar del Plata, Argentina. In 1998 she studied photography at the Speos Ecole de la Photographie in Paris and earned a MFA in Photography from Barry University in Miami in 2009. Since then, she has exhibited extensively at galleries, museums and cultural institutions in the US and abroad. 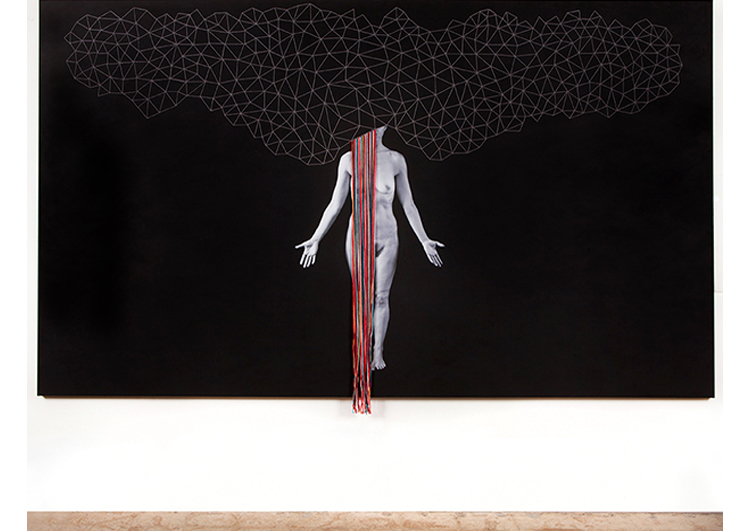 Her work is included in collections such as the MDC Museum of Art + Design, the Lowe Art Museum at The University of Miami, the Fototeca Latinoamericana in Buenos Aires, The Girls’ Club Collection in Fort Lauderdale, The Bunnen Collection in Atlanta, and various private collections throughout the world. Font’s work has been published in print and online: Inventario Magazine, Italy; Geografie (Book), Corraini Edizioni, Italy; Italian Marie Claire, Photo+ Magazine in South Korea; EnFoco’s Nueva Luz Photographic Journal; ArtNexus Magazine; Arte al Dia International; Las 12, Pagina 12, Argentina; Revista Magenta, Argentina; Jaque al Arte, Argentina; Wall Street International Magazine, The Miami Herald, The Miami New Times, Artdistricts Magazine; Revista Aplausos, El Nuevo Herald; Irreversible Magazine, Boca Magazine; Lenscratch; Elisabeth Avedon’s blog, aPhoto Editor blog, Light Leaked Photography blog; Artistas Argentinos en Miami (book) and the Girls’ Club Collection catalogue among others.